Always wanted to investigate an haunted school? Now's your chance click on the picture to take you to our friend Don Wagners page to get in contact with him about investigating his school called Broughton Elementary! Cost is $275 for roughly 10-12hrs investigating!! Great Deal!! Please get permission before entering any of these places. Some of these places has no trespassing signs and ghost hunting is not worth going to jail for. Hanging Rock - In the early 1900's the church along the road was a preacher who killed himself. Cacapon State Park- Appiriton has been seen on the park. Berkeley Springs Castle- The most haunted room is the Colonels Suit on the 2nd floor. Loud crashes, sometimes furniture moved around, footstep sounds when no one is there, laughter of children. Only British-Norman Style Castle in America. Boydville Mansion - Reported Activity. Darksville Church- Locals say that during a church service one sunday morning in the winter time the roof collapsed and killed some people inside from heavy snow. Today its abandoned but you can still hear voices coming from the old church. Edgewood Manor - Appritions sighted, voices heard, and other strange noises heard. Hammond Mansion- During the Civil War some woman were burned inside of this old ruin mansion and they say they still roam the ruins. Caution, this is falling down. Kings Daughters Court Hospital- It was built in 1797 as a prison. All kinds of activity has been recorded. Appritions has also been seen as well. Spring Mills Plantation- A phantom Civil War Soldier has been spotted numerous times here. The Old Mill - Lights have been seen in the second and third floor and reports of appritions has been spotted here. The Poor House- Used to be a small mental ward hospital. Appritions of civil war soldiers on the property. Tomahawk Presbyterian Church Cemetery- Activity has been reported. Wheeler Mansion- This is a very active location, Appritions have been seen, voices heard, foot step sounds all the time. Flatwoods- In 1952 ontop of Fishers Hill is the location of the Flatwoods Monster. Bethany Cemetery- Reports of appritions seen in the graveyard. The grave dates back to the late 1700's. Bethany College- Phillips Hall is reported to have a ghost by the name of Sarah. She hung herself in the attic of Phillips Hall. Things would come up missing and then reappear later on. Vancroft-Vandergrift Mansion- Woman hung herself in the stable when she found out her husban had an affair with another woman. She susposedly haunts the location. 5th Street Hill - A young female spirit can be seen at this location standing near a bridge in this area. Barboursville- On Childers Run Road a young boy susposedly had died from drowning during a flood. He has been seen walking along the road. Colonial Lanes- Several instances of voices, the feeling of a presence, footsteps, and images in photographs. Frederick Hotel- Strange noises, voices heard and footstep sounds. Susposedly haunted by several ghosts. General Jenkins Plantation- General Albert G. Jenkins residence. Activity throughout the house, including sightings of figures , feelings of not being alone or being watched, footsteps, impressions as if a figure was lying on furniture. Green Bottom Cemetery- This cemetery is a paranormal hot spot, with EVP'S and ghosts being a common sight. Keith Albee Theater- Reports of a female apprition has been seen. Mountaineer Opry House - When your on the stage you can often hear strange sounds and voices. River Park Hospital - The ghost of a nurse still going about her duties has been seen. Spring Hill Cemetary- Susposedly a very active location. Western Regional Jail- This Jail was built in 2003 after moving a family cemetery to make room for this jail, some of the strange happenings include strange noises and opening of doors. William L. Grimes D.D.S. Inc- Reports has it that a young girl died at this location from natural causes. Shes been seen here roaming around. Grantsville- A peddler was murdered close to the Betts Farm and ever since strange things started occuring in the Betts Home. Babcock State Park - A woman murdered in the park haunts the location. Her spirit has been seen. Big Sewell Mountain- Site of one of the largest Civil War Battles ever fought. Sightings of a ghostly Drummer Boy and the sounds of a drum being played. Blume Haven Inn- There are 2 recorded deaths in the Inn. One is believed to be that of the former owner himeself who haunts the location. Glen Ferris Inn- The apprition of a Confederate Soldier dressed like an officer has been seen. 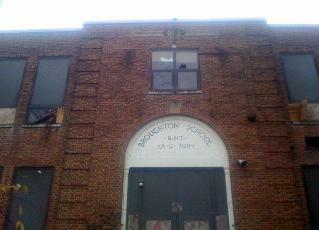 Kingston Elementary School- Several ghosts rumored to haunt this abandoned location. Footsteps heard, children laughing. Old City Hall in Montgomery- Footsteps heard upstairs,and other strange noises occured. Its believed to be that of the former Fireman-In-Charge. Pax Cemetary- A woman has been seen wandering the graveyard. Reports says that she died in Washinton from child birth complications and was brought back to where she lived before which is in the Pax Cemetary location. Plum Orchard Lake - Young female spirit has been seen. Ratliff Hall - Noises of footsteps can be heard and doors will slam shut. Whipple Company Store - voices heards and other strange sounds. Glenville State College Clark Hall and Louis Bennett Hall - a female spirit has been seen walking the halls and even visit some residents in Louis Bennett Hall. Glenville State College Pickens Hall - Strange Noises heard. Dark shadow figures are seen walking through the main lobby. Van Meter's Farm - Reports of the headless ghost of Van Meter searches for his lost head. Federal Prison Camp Alderson- The Davis Hall of the prison is where employee's has heard voices and other such strange sounds coming from. General Lewis Inn- This is a very active location. Voices heard, cold spots, appritions seen. Greenbriar Hotel- This swanky 5 diamond hotel has been a site for the rich, and many political figures over the years. And is said to have a few ghost that can be seen roaming the confines of the hotel. John Second North House- A young woman was deeply in love with a soldier, her parents sent her to stay with relatives in the John Second North House. She stayed in her room alone very depressed. During a visit to her parents house for Christmas, She saw her soldier and he promised to come to Lewisburg and see her. He came to see her but was only allowed to speak to her on the street. After he left he paid children to send flowers to her everyday. He was never able to come again. And in misery and pain, she hung herself in the only closet in the house. Since then the owners of the house had various complaints of smelling flowers, seeing a female ghost, One owner of the house grew so disturbed at the sounds coming from the closet that he boarded it up. Lewisburg- Witness's have reported a phantom army appear in the sky and march west. Witness's said all the soldiers were wearing the same white uniforms. Lewisburg Courthouse- From murderers, to rapists, were tried in this place and sentenced . You can hear horrifying moans coming from the court house. Maysville Market- Footstep sounds when no one is there, things get rearranged by themselves, lights go off and on when the circuit is turned off, telephone unplugged and rang. Sam Black Church- is where the grave site of Zona Heaster Shue lies. Zona died one evening, and her husband reported she fell down the stairs. Her mother never believed the story and prayed that Zona would come to her and tell her the truth. Two weeks after her death, Zona appeared to hermother and said that her husband pushed her down the stairs. The husband of course said she had simply just fallen. This manifestation of Zona to her mother brought about the arrest and conviction of the husband.You can read about the case of Edward Shue in old newspapers in Lewisburg, and on the Internet. According to Case's Comment,this is the only case in the United States where a man has been convicted of murder on the testimony of a ghost. Peterkin Religious Retreat Gravity Hall - Back in the 70's, a preacher died of a heart attack in this room while getting up to use the bathroom. Weirton Medical Center - Appritions have been seen right along with voices and medical equipment turning on by themselves. Weirton Steel Mill- The steel industry has claimed many lives over the years, many of which by extremely traumatic means. Today some of those workers still roam the plant. Maslin-Gamble Mansion- There has been reports of activity going on at the home like voices heard when no one is around. Lost River State Park- There has been the ghost of Charles Sagers who was murdered in the historic Lee Cabin and now haunts it. Cunningham Massacre- A small, but a very bloody war took place here. Deegan Lake- Reports of a male ghost roaming near the dam area. Flinderation Tunnel- We've had alot of activity go on there. We actually heard kids talking and what sounds like adults talking, when its none of us. It wasn't any of us. We go check to see if anyone is around and no one is there. I had the back of my hair pulled on once. We caught alot of EVP's there. We enjoy going there. Harden Elementary School- The ghost of Hattie Harden who was a former principle here has been numerous times. Meadowbrooke Tunnel- This tunnel we investigated and picked up a female singing. There is suspose to be a little girl who was killed on the tracks while riding her bicycle. Voices are often heard out loud. Waldomore Hotel- There is reports of activity at this old hotel in downtown Clarksburg. There is also reports of someone who hung themself in one of the rooms. Watters Smith State Park- Reports of active in the old Smith Home. Grasslick Road - Witnesses report hearing children’s screams, and sometimes late in the evening. This is location of the Greene Murders. Ravenswood Theater- There is an apprition that has been spotted, reports believe it to be the man who died in a fire that broke out in the attic. Charles Town Courthouse- This is the location of where John Brown was sentenced to be hung. His spirit has also been seen here as well. Charles Town Junior High School- Rumors has it that its haunted by a former janitor. A young boy died on the school grounds and you can here him laugh and run around. Charles Washington Inn- Lights go off and on, doors slam shut by themselves, locked doors found opened by themselves, vases turned over. A young girl named Emily has been seen. She died in the "Pink Room". A window that cant be cleaned cause it has a constant childs hand print on it all the time. Claymont Mansion - Built by George Washington's grand nephew. After a fire destroyed the interior in 1838 , it was rebuilt. Spirit of a wrongly hanged servant haunts the grounds. Elmwood Cemetery- Over 200 civil war soldiers are buried in the cemetary. Ghostly apparitions dressed in old Civil War uniforms have been seen in the cemetery and surrounding grounds. Duffields- Along Duffield Railroad Tracks, there is an old abandoned home that belong to a young girl named Jenny. Story goes she received word her husban died and she went running down the tracks not hearing or seeing train come and it killed her. Screams and other noises has been reported from this location. Harpers Ferry Camp Hill- Reports of Phantom Fife's and Drums heard on this location. Harpers Ferry Kennedy Farmhouse- Reports of foot step sounds, people going up and down the stairs when no one is there,sounds of people talking, breathing and snoring. Harpers Ferry Railroad - In the 1833 a woman named Jenny lived in a shack near the tracks and she caught on fire by accident in her little home and ran out screaming down the tracks before she was burned alive. Harper House- This is the oldest standing structure left at Harpers Ferry. Rachel Harpers friend Hamilton died in this home. Rachel susposedly fell from a ladder and died at this location. Alot of strange event and an apprition of a female seen here. Harpers Ferry St. Peters Catholic Church - Many people have seen a priest by the name of Father Castello outside of the church that was built in 1833 and several people have heard the screams of soldiers. Harpers Ferry The Fire Engine Room- John Browns Ghost has been seen in this building. He was a fiery abolitionist that was convicted and hung in 1859 somewhere in the area. Harper's Ferry Town - Numerous spirits throughout the town. Hilltop Hotel - Apparitions of soldiers marching throughout the hotel and the grounds. Hog Alley - Apparition of Dangerfield Newby still wonders Hog Alley. The Old Opera House - Built in 1910 and is rumored to be haunted by several ghosts. Shepherd College Gardiner Hall- Strange noises and voices heard. Witnesses say a woman died at this location. Shepherd College Kenamond Hall - A ghost of a little boy who likes to play with the tv and other electronical equipment. Voices have been heard. An apprition has been seen in the basement of this building. Shepherd College Miller Hall- Reports of a cloudy mist seen, things dissappearing and reappearing, strange noises, water faucets turning on by themselves. A young girl susposedly hung herself in the attic. Shepherd College Shaw Hall - Reports has it there was a cemetery there that ran along the edge of the school property. There is a woman that stands at the windows at the ends of the dorm floors. Shepherd College Turner Hall- A ghost by the name of George susposedly haunts this location. Wager House- Located next to the Harper House in Harpers Ferry. Now known as the Park Library. Appritions has been spotted numerous times. Alum Creek- The alum creek cemetery sits behind the Alum Creek Missionary Baptist Church. Several people have witnessed an elderly gentleman wandering aimlessly seemingly confused. When approached he disappears. Cabin Creek Quilt Shop- This location has alot of history and eyewitness's even say a ghost as well. Capital High School Theater - The theater of Capital High School is haunted by an unknown specter. Students and faculty have reported feeling a presence, often while working late to prepare for school productions. If you are quiet, you can hear footsteps walking across the stage leading into the workshop. The most common strange occurance is the mysterious dimming of lights, even when the sound booth is locked and no one is in there. No one knows for sure who or what haunts the theater. Capitol Plaza Theatre - This theatre was built in 1909 on the site of the old Welch Mansion that had stood there since 1798. The theatre still houses some of the family that once lived in the mansion. The former theatre where "Mountain Stage" was recorded. The most prolific ghost here is that of John Welch. He was the son of the man who built the house and heir to the Welch fortune. John is very sneaky and likes to play around with peoples minds. He is quite protective of the place and of the actors who frequent the stage. Another ghost, not quite as active, is known as Molly Welch. She was John's youngest daughter who died of pneumonia in 1840 around the age of eight. She is very shy, but sometimes when an actor is standing on stage, she can be seen sitting in the front row of the balcony. Charleston Train Depot- Susposedly very active site. From the reports. Civic Center - there has been reports of voice heard and footstep sounds when no one is there. Dunlop Hollow- A black woman was hanged at campsite # 35. She has been seen roaming. Fresh Seafood Company Market and Restaurant- Appiritions has been seen. Along with other strange noises and voices have been heard. Nitro Street Bridge- In 2001 a vagrant man got drunk and somehow ended up burning to death underneath the bridge on the Saint Albans side. Since that day in early January he has been seen wondering around that area. Office Building 205 Capitol Street- was the Woolworth's five and dime. There was a horrible fire in March of 1949 and seven firefighters were killed. It is said that you can still see some of the firefighters walking the halls of the building. Potters Cemetary- Reports of an Apprition has been seen at this location. Shelton College- Sightings of a Woman In Pink has been spotted numerous. Spring Hill Cemetary Park- Reported activity going on here from eyewitness's. More details about the location to come. State Capitol Building- many sightings of a woman and a maintenance man who died of a heart attack. A lot of employee's have reported seeing them. Sunrise Mansion and Carriage Trail- This was built by Gov. MacCorkle in the 1800's it sits on a hill that overlooks the city of Charleston. Gov. MacCorkle's ghost has been seen by numerous people and employees in and around the museum. Also the graves of two unidentified women are there as well, the young women were found murdered on the grounds, and are said to still be seeking revenge to this day. The Hale House - is a historical site located near Cabin Creek, WV. A married couple lived in the house with his uncle, The husband was abusive and was murdered one night. After an investigation no one was charged, the man is still seen roaming the grounds seeking justice. Thomas Memorial Hospital- When patients pass away strange light anomalies has been seen numerous times. University of Charleston Geary Student Union Riggleman Hall - Reports of feeling strange presences, strange noises, voices and shadows have been reported by students and staff alike. Riggleman Hall is known for seeing the ghost of a young girl who commited suicide after discovering she was pregnant. Weston State Hospital- Very active location. Reports of full body appritions seen, children heard, and adult voices heard as well, doors slamming shut and opening up. There is a Civil War section that susposedly has a civil war soldier spotted in the area. Click on Image to Book your Investigation Here! Slone Cemetery - There is the ghost of a woman who comes up behind you and blows on your ears. Logan- The ghost of Mame Thurman has been seen. Her body was discovered on a mountain where she was murdered and shot twice at close range. Solitude Farm- This is a very active location. There is a Civil War Soldier who has been seen in the home, footsteps sounds, voices heard. There is suspose to be more then 1 ghost that haunts the location. Barrackville- On Straits Run Road in 1949 a 3- year old girl was being attacked and badly bitten by a dog and some drive byers saw the incident jumped out grabbed the dog and took it to a large flat rock near by and mutilated the dog. Ever since appritions of the dog has been seen in the area. Benton's Ferry- Mournful chanting has been heard. Murdered slaves march in a ghostly procession. Caroline Business Center- Footstep sounds, doors opening and closing like someone went through them. When we investigated this place, we had alot of strange activity going. We already have permission to go back again this year. Grant Town Mine- 6 miners were killed here and all six were spotted walking with red lanterns past some workers who was working there towards the South Main Section. Mannington - The witches grave on highland. Many sightings of the witches and warlocks have been seen. Number 6 & 8 Mines- In 1907 the mines exploded and killed 362 in #6 and 367 in #8 and 12 horses were killed. Not to long after this incident the mines were reopened and the new miners kept reporting they were hearing the sounds of horses galloping coming down the tunnel. Pricketts Fort Homestead- The Prickets Homestead House, witness's have reported seeing a female apprition standing upstairs starring out a window. Footstep noises on the 2nd floor and going down the stairs. Note this is not the real location of the Pricketts Fort. No one knows where its real location is at. Pricketts Fort Meeting Hall- Strange noises have been heard inside the building. Rivesville- On certain dark stormy nights out of nowhere comes a dark horse and a rider with no head on US 19. Numerous sightings of this apprition has been spotted. Fairmont never did have an civil war battles but a small skirmish was fought there on April 29,1863. The objective was to raid and destroy as much of the Baltimore and Ohio Railroad as possible and to collect as many horses and cattle as they could to feed the chronically short Confederate Army. From eyewitness's they seem to believe this might be the how the dark horse and headless man came to. The Old Depot- In 1915 a man working for the railroad was decapitated at the location. Not to long after reports came in see his ghost. Vinegar Hill - Many years ago some brothers made cider on this hill and sold it to a large Inn used by the railroad men and cattlemen who passed through fairmont. On one stormy night a bolt of lighting struck close to the men who were hauling cider and it scared the mule's pulling their wagon causing the mules to stop suddenly throwing the men off and a barrel of cider. A heavy barrel of cider trapped one of the men. They were all drunk from sampling cider all day and not thinking clearly, one of the men pushed the barrel since it was to heavy to pick up causing the barrel to roll over top of the guy crushing him to death. Moundsville Prison- Built in the late 1800's and closed in 1995. This prison harvested some of the worst criminals in America. There were hangings, murders, and executions that took place on the prison grounds. There has been reports of appritions seen, voices and foot steps heard, doors slamming shut, being touched etc. Very active place. Click on image below to book your investigation at the famous Moundsville Prison in WVa! Boys Industrial School- Activity such as footsteps doors slamming and voices heard here. Lakin State Hospital- This location was torn down a few years ago. But the activity might still remain on the grounds. Get Permission to enter first. Lowe Hotel- This hotel is probably the most haunted hotel in West Virginia. There is activity all through the hotel. Plumly Mansion - There was a woman that got thrown in a well by her husband. Now she susposedly haunts the location. There was also a black man who hung himself on the 2nd floor. This place is abandoned. Get permission and take caution. Point Pleasant Munitions Dump- This is the famous location of where numerous eyewitness's has seen the Mothman. Point Pleasant T.N.T. area - The U.S. military used to make explosives there during World War II. This is the location where sightings of the infamous Mothman have occurred. The first sighting was here at the old North Power Plant, now torn down in the mid 90's. Sandy Huff Hollow Road - Susposedly activity in this area. War Annex Gym- A woman reportedly hung herself in the girls bathroom and ever since strange events has been witnessed. Airport- Strange unexplainable events have been witnessed by others. A plane crash close to the airport killed a few people. Bluefield State College Mahood Hall - A young girl has been spotted in the old hallways and basement of the hall. Concord College - Reports of an apparitions presence. Lake Shawnee- Sightings of a little girl, voices heard. There were alot of indians who lives in the area. Strange anomalies showing up on camera. Very active area. Mavis Manor - Appritions seen, footsteps heards. The Breezy Seaside Themed SS Montauk is the mosted haunted room in the Manor. Woodlawn Memorial Park- In the old section of the cemetary there has been voices heard and appritions seen. Wade Elementary School - Different sightings has been reported. Children running down the halls. There has been a few people killed at Wade. Woodlawn Cemetery- couple appritions has been spotted. The Old Stone House- Built in 1815 this place served as a prison and a hospital. There has been reports of strange things happening. Codger Town- Guyandotte River Bridge is where the ghostly wagon and horses of a pioneer family were killed and have been heard. Williamson Memorial Hospital - Reports of appritions seen. Cheat Lake- In the early 1970's, 2 female students were walking and were picked up and they had their heads decapitated. Clarion Hotel Morgan- This Historic Hotel has alot of history. In Room 314 a little girl susposedly died from drowning in the bathtub and people who stay in that room hear her. East Moore Hall - Elizabeth Moores apprition has been spotted hovering over the pool. Gobblers Knob- There is a very old graveyard in an old hollow known as Gobblers Knob. A man in the back corner of the yard in a heavy blue coat with a rifle has been reported here on multiple occasions. Morgantown Public Library - The public library employees have reported an apprition. Pierpont Apartments - Reports of shadows, voices and objects appearing and disappearing. Seneca Center- This used to be an old Glass Factory and was converted into a small shopping center. Where the loading docks are. There has been reports of the doors opening and closing when no one is there right along with other weird strange noises. Warner Theater- There is reports of a very lively active spirit roaming the building. Also, there is reports that a body was found in the theater years ago. West Run Road & Cemetery- believed to be an active haunted location. WVU Beta Theta Pi Beta Psi Chapter- Residents have reported strange sounds in a lower part of the house. A former resident hung himself there. WVU Boreman Hall- is an all girls dorms. Reports of an apprition has been seen. Strange noises coming from the attic and the females would be awaken in the middle of the night by the vocie of a female screaming. WVU library- The older section of the library people have heard doors opening and closing without anyone being seen. The side desk areas also seem to be heavily occupied as writing can be heard from empty desks. Apparitions have also been seen. Courthouse- Voices have been heard an appritions has been seen. Sweet Springs Sanitarium- Very brutal history. Sounds of voices heard, appritions been spotted, being touched. Dutch Cemetery - Samuel Crawford's spirit has been seen standing above his grave by 2 men in 1888 in the Dutch Cemetery. Laurel Road- A man was killed on this road and witness's have reported seeing him. Peters Creek Valley- An apprition of a Yankee Soldier and his dog walking behind the soldier has been spotted numerous times. This is also known as the "Haunted Valley". Veterans Memorial Park- Reports of an apprition has been seen roaming around. Capitol Music Hall - Ghosts are said to haunt the theater. Main Street Bridge- There are 2 ghosts that has been spotted, they were reported to have died accidently around the bridge area. National Road- This is an active area. Sounds of cannon fire from the road has been heard right along with gunfire and voices. Civil War battle took place in this area. Old Fire Department - Strange events has occured here like voices heard doors opening and shutting for no apparent reason. Peninsula Cemetery- There have been numerous reports of paranormal activity. Roney Point Hospital- Used to be a T.B. Hospital. Its been closed for years and is abandoned. Reports of activity range from voices, footsteps and full appritions. Tunnel Green - said to be haunted by a man from the 1900's who was killed by a train. Seneca Caverns - There has been voices heard from one of the caverns. Camp Price- People heard sounds of marching feet. Cass Scenic Railroad- Reports of appritions seen and voices heard. Denmar State Hospital- reports of footstep sounds and voices heard when no one is there upwards of 1000 African-American men and women died from tuberculosis. Droop Mountain Battlefield - On occasions sitting on the barrel of the cannon is a soldier. There has also a full calvary marching in mid air. We would like to hear about experiences at this location. Droop Mountain Rangers Station- Strange occurances here. Civic Center- Sounds of foot steps has been heard when no one is there. Hopemont State Hospital-The front part of the hospital, the old section, is said to be the home of the spirits of both male and female patients. The second floor purportedly has a lot of activity because it was the surgery ward for TB patients. Kingwood Public Library- Employee's have reported books flying off the shelves, heard strange noises, doors opening and closing by themselves, footsteps are heard. Mingo Cemetery - Strange occurances here but good audio picked up here. West Point - Apparitions of a little girl have been reported. Eleanor House- Its now used as an office complex, but strange activity has been reported. More details to come. McCausland Home- Strange noises and footsteps heard. Battle of Scary Creek- In St.Albans/Teay's Valley in 1861 Battle Of Scary Creek broke out. Three weeks after the battle people reported hearing the sounds of gun fire, screams, strange lights hovering around the battlefield. Beckley Courthouse - Reports of a woman who likes to appear in the jurors room. 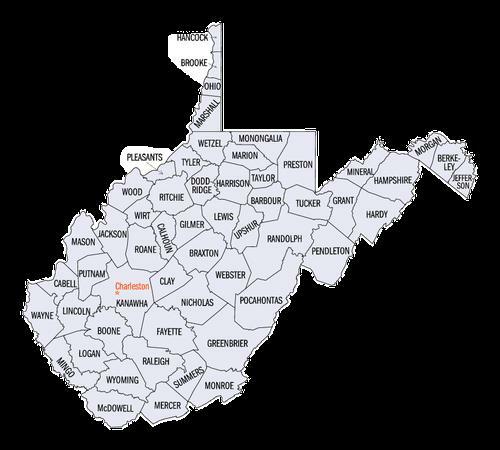 Beckley Junior High - Students and faculty have made claims of loud footsteps going past them in the hallway when no other person was present, unexplainable whispers and murmurs and water faucets turning on and off in the restrooms for no apparent reason. Sandstone Ghost Lights- The ghost light originated during the Civil War, in an area that was made up of Confederate supporters. Southern Communications Building - appritions has been seen. Trap Hill Fire Department- Some fireman have reported the spirit of an old fireman who died in a fire there. Davis & Elkins College Graceland House - Also known as Graceland-Halliehurst Mansion, susposedly haunt by a slave who was beaten to death an buried in the house somewhere. Noises, feelings of being watched and followed. Davis & Elkins College Hallie Hurst House - Construction began on the mansion aronud 1890. Most common activity is noises. The employee's believe it to be Hallie. Reports of women voices, objects dissappearing and then reappearing. Graceland Inn- Reports of a ghostly girl has been seen, its said that shes the daughter of the former town founder. Rich Mountain Battlefield- Witness's have reported hearing voices, gunfire and even appritions at this location. Mystic Manor B & B - Reported Activity. North Bend State Park - Reports of a woman who was accidently killed at Tunnel 19. Oxbow- There is ruins of an old home in this location and a woman has been seen in this house. When someone goes in there is no one in there. Silver Run Tunnel- A woman in a white dress has been seen. Spencer State Hospital - Activity all through the building, moans, voices heard, dorms slamming shut, appritions spotted. Very Active Location. Could be a health hazard wear a protective mask. Steel Hollow Cave- Reports of a woman who smothered her child to death in this cave and witnesses have reported hearing a babys cry and even seen the mother walking around. Great Bend Tunnel - The ghost of John Henry haunts this tunnel . Roughly 1 out of every 10 men died here. Several men did lose their lives here. Reports says they are not sure where John Henry died at. Pence Springs Resort - Built in 1918. During the 1950's-1970's it was used as the state womens prison. Now used as the Greenbrier Academy for Girls. Appritions has been spotted in the building. Pipestem Resort- Witness's of a ghostly figure riding a horse has been seen. Darkish Knob- Served as an underground railroad. A young girl accidently killed herself. Greenwood Cemetery- Reports of strange feelings noises heard and even an apprition seen. The Wells Inn - Guests and staff report the sounds of footsteps down the halls occasionally a door that opens or closes. Room 324 susposedly refuses to open. Macedonia Road - A ghost is seen there in the road. Mount Lebanon Road - A young boy was accidently killed at this location about 90 years ago. Ransdell House - Susposedly haunted by Civil War slaves and soldiers. This house was used as the Underground Railroad. You can hear chains rattling at night and can hear soldiers talking. Doors close by themselves and light go on and off. Doolin Run- Site of the Jennings Gang. There has been reports thats the spirit of the Jennings Gang roam the hills. Foxhunters claim they have seen silhouettes of the gang members as they moved along the ridges. 13 & Avery & Quincy Hill- Doors slamming shut, voices heard, footsteps running up the basement and an apprition was seen. 916 Juliana Street- Reports of a strange woman who looks out from the upstairs in the front of the house when nobody is home. Ambrose Hill- Apprition of a Black figure that looks like a man. Ann Street- 10 year old girl named Bessie Bartlett died in the home from Scarlett Fever. Strange events has happened. Art Center- The theater was destroyed in a fire in 1928. At the time the theater had some ghostly inhabitants which afterwards roamed the land searching for a new place to haunt. At the Art Center and in other buildings on the city block where the theater once stood people have smelled hot buttered popcorn and have noticed heavy objects being lifted and falling over as if they were picked up and dropped by unseen hands. Bickel Estates- Reports of a woman standing outside close to the road. Blennerhasset Hotel - Voices heard and appritions spotted throughout the hotel. It was owned by the same owners of the Mansion on the Island. Blennerhassett Island - Reports says that the former owner Margret has been spotted in the mansion. Strange noises has been heard as well. Blennerhassett Museum- Third floor susposedly has 2 different ghosts roaming around. One is a little old man in a straw hat, the second is a woman. Boreman Wheel House - There is reports of a male apprition thats been seen in the basement. Camden Clark Hospital- Apprition of a female nurse named Mrs. Blumbit shes spotted on the 2nd and 5th floor. East wing has an apprition of a former patient. DeSales Heights School - Voices of young children and their appritions seen. This used to be an old Catholic School, But its been torn down. Susposedly a very activity location. Eaton Tunnel- Reports of foot steps, gravel shuffling around, and voices heard. Quincy Park- Stairway leading down to Avery Street has had an apprition of a Shawnee Indian about half way down the steps. Riverview Cemetery - All kinds of activity. The Weeping Woman Statue is here. Appritions have been spotted right along with voices. Smoot Theater- Built in 1926. Shadows has been spotted right along with unexplainable noises as well. Southside K-Mart - A womans voice has been heard. There was suspose to have been a fire that took place in a home that k-mart now stands at and its believe to be a woman that died in the fire. St. Josephs Hospital - In the South section of the hospital there has been reports of a ghost. Click on image below to book your investigation at the old 1907 Trans Allegheny Bookstore in Parkersburg WVa! Bud Mountain- This is the location of where Berg Hammond has been heard playing his music. Pineville Elementary School - It's said that a janitor got stuck in the boiler room of the school and he got burned alive. He's been spotted walking the hallways. Road Branch Grade School- Reports of doors opening and closing, voices heard, commode's flushing when no one is around. There is also reports that 2 men hung themselves on the grounds of where the school is at. Twin Falls State Park- Reports of activity on the park grounds. As soon as we get more details of the activity we will post it out. If you have any local investigations you want us to add here, e-mail them to me and we'll post them out. Have a place that you know is haunted? Send us an E-mail below! For subject put in Local Investigations!